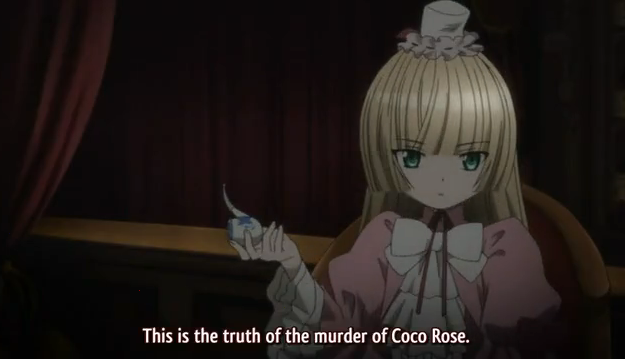 Gosick episode 21 is the revelation part of the Coco Rose arc, so I don’t want to go into too much detail. Just about anything I say would be spoilers. I’ll just make a quick observation about some of the machinations surrounding the mystery. 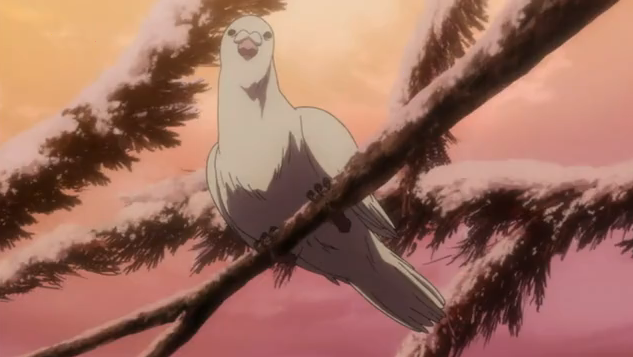 Pigeons, sometimes called doves, are used both in communications and in magic acts. This episode revealed the king of Saubure, who was accompanied by Jupiter Roget of the Ministry of Science. The implication seems to be that Victorica’s father, Albert, the Marquis de Blois, was attempting to use her to dig up some dirt on the King. In the previous arc, the Ministry of the Occult was trying to dig up dirt that would weaken Roget and the Ministry of Science. Here Albert seems to be making a play to become king of Saubure, by damaging the popular opinion of the current king, Coco Rose’s husband. The great thing, of course, is that Victorica manages to find a way to satisfy Albert that she has fulfilled her obligation by solving the mystery, while preventing him from getting the most damaging pieces of the story. Aside from this, there were several doubles, more than I expected, including an extra set that seemingly will have a big impact on the final arc. There are only three episodes left, so next week kicks off the finale. Hashi reports that the final episode has already been recorded. I’m looking forward to seeing how this series ends. Yes, a good episode. The only thing I didn’t like about it was the wildly “coincidental” meeting at the very end — but the tendency for convenient coincidences has been a trait of this show from the beginning, so I guess I should be used to it by now. I’m aware that “Gosick” is from a fairly extensive line of (ongoing) novels, so there’s obviously way more story out there than we are going to see, which means we won’t be presented with any kind of “final” resolution — but I hope they manage to close out this part of the story in a satisfying manner while leaving the door open for future adventures. Yeah, the meeting at the very end was over the top, but in honesty, they do these coincidences all the time, such as the cook that gave Kujo a ride going to see the show that was the center of the mystery, where she bumps into a mysterious man who is later revealed to have major significance. You might be right about the ending being less definite. Well, we don’t have a lt of time to wait to find out, since the final arc is upon us. Right. I think my “favorite” one was where the book falls off the library shelf and hits Victorique on the head, and it “just happens” to be Leviathan’s pop-up book autobiography. Oy! But there are so many other things I enjoy about this show that I long ago decided to just give that kind of stuff a pass. Actually that’s a really good one, since it “coincidentally” happens just as Kujo is exploring the tower where Leviathon was killed, and where a big mystery tied to the book breaks out. LOL.